Dr. Andrew Kleinknecht B.Sc., D.C.
Dr. Andrew Kleinknecht, the son of a chiropractor, was born in Elmira, Ontario. He completed his undergraduate degree at Mt. Allison University and graduated from The Canadian Memorial Chiropractic College in 1993. In 1994, he moved to Nova Scotia to establish his current practice with his wife, Dr. Wanda Lee MacPhee, who is originally from Prince Edward Island. Their hope is that their daughter Claire and son Thomas will be third generation chiropractors. (And it looks like 1 of 2 may end up there!) Dr. Kleinknecht is an outdoor enthusiast and he enjoys fishing and canoeing when he is not with his family. Dr. Kleinknecht maintains his expertise in chiropractic with continuing extensive post-graduate training in chiropractic care for the entire family. He has great interest in paediatrics and geriatrics as they pertain to chiropractic. 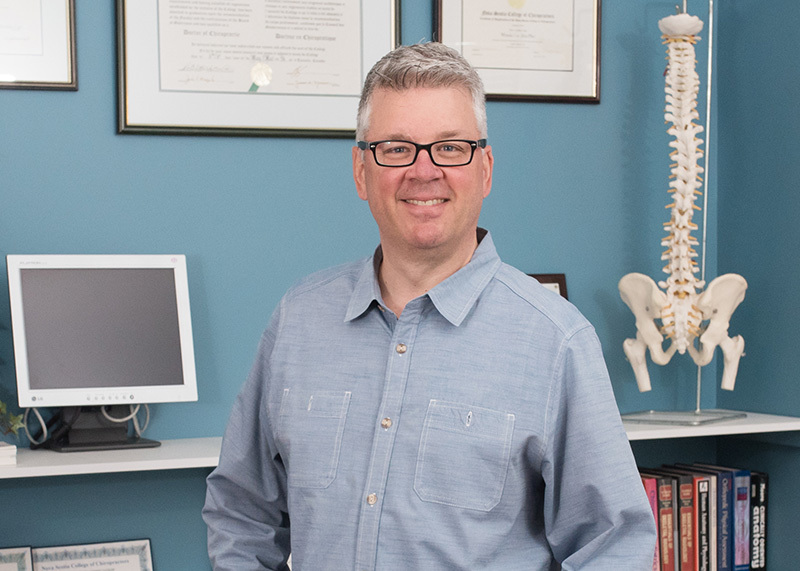 Dr. Kleinknecht is a member of the Nova Scotia College of Chiropractors, the Canadian Chiropractic Association and the International Chiropractic Pediatric Association. Previously he has served on the Board of the Nova Scotia College of Chiropractors, the regulatory division of the profession, and the Nova Scotia Chiropractic Association. He has a special interest in family health, quality of life and longevity. A sought-after speaker in his own community, Dr. Kleinknecht is fascinated by human potential and helping others maximize their unique gifts in life. This, he has learned, is much more easily accomplished when we are as healthy as we can be! Dr. Wanda Lee MacPhee B.Sc., D.C.
Dr. Wanda Lee MacPhee was born in Souris, Prince Edward Island. She completed her undergraduate degree at Mt. Allison University where she met her future husband and business partner, Dr. Andrew Kleinknecht.She graduated from The Canadian Memorial Chiropractic College in 1994. The same year she established and directed a very busy practice in Bedford, Nova Scotia. After the birth of her first child, she and her husband joined forces in 1990 at St. Margaret’s Bay Chiropractic Centre. Dr. MacPhee has served on many boards and committees in her commitment to the development of chiropractic in the province as well as the country. 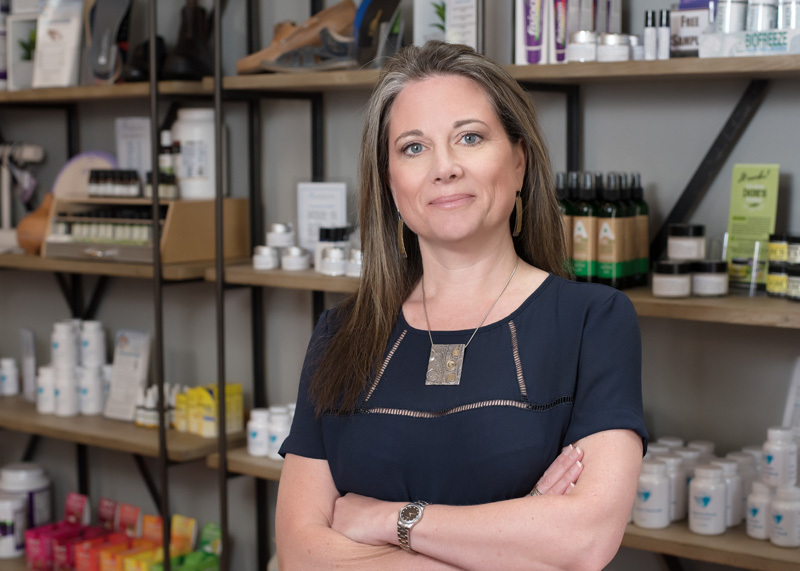 She served as the Chair of the Board, NS College of Chiropractors, Registrar for the province, President of Canadian Federation of Regulatory Boards and currently at the national chiropractic association. She is dedicated to continuing education in all facets of her busy family practice and is always taking courses and developing new skills and knowledge. Recently, that led to the creation of custom-blended supplements for St Margaret’s Bay Chiropractic Centre called “Dr. Wanda’s Wellness” so she and Dr. Andrew can assure themselves (and you) of the quality and content of your nutritional support as well as good value. Dr. MacPhee is Mom to teenagers, Claire and Thomas, and has maintained her practice to three days per week in order to enjoy time with them and volunteer in the profession and community. You may also hear and see her online with Beyond Your Wildest Genes – A weekly podcast and online health education company that she has partnered in with her colleagues, Dr. Michael Acanfora and Dr. Noah De Koyer of Bayonne, NJ. They have over 1 million subscribers to their podcast and share foundational principles of self-care and wellness care in physical, chemical/nutritional and emotional pillars of health.